On Christmas Eve, my family’s tradition has been to feast on Jewish appetizing. Belly lox, wild caught Western Nova, oily sable, smoked sturgeon, whole, bronzed chubs and whitefish; blini piled high with salmon roe, sour cream and raw onions; potato latke drizzled with creme fraiche and wasabi infused flying fish roe. Dutch herring, schmaltz herring, whitefish salad. Baskets of warmed bagels, bialys and rye pumpernickel bread. Scallion cream cheese and softened butter; sliced onions, lemon wedges, capers; salads of hearts of palm and tomato, julienned celery root in vinaigrette. In times of plenty (such as those Reagan years where the wealth trickled down on only those who already were well-to-do, i.e. 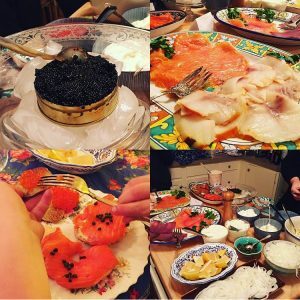 my family) there were fat tins of Russian caviar, nestled in ice, which we served with a mother-of-pearl spoon onto warmed little crepes and dressed with a hit of melted butter and a splash of lemon. Frozen bottles of vodka, aquavit, white wine, proseco, Bass ale and frosty cans of Narraganset. For desert, sticky apricot rugelach, chocolate babka, slices of rich, toasty halvah with glasses of grappa or port. Then we would give a sigh of contentment and ritually sacrifice a Christian baby. Just kidding. We would retire to our entirely secular Christmas tree, hang stockings for the children and open a present or two as a prelude to the morning deluge of gifties. Inevitably, you would wake at 3am, fingers still fragrant of fish oil, dying of thirst as the salt-cured goodies had leached every last drop of moisture from your very soul. For the past fourteen years or so, I have been in charge of fish procurement. I am not a huge fan of being rushed, waiting on endless lines and being crushed by frenzied crowds of smoked fish fans, so I would wake up at 5am on Christmas Eve, make my way to Delancey Street and be amongst the first on line at Russ & Daughters — a shop that is so good, so noble in its curatorial perfection that it should be enshrined forever as one of America’s great cultural treasures. After 14 years you make friends with the group of eccentrics that feel, like you do, that it is better to brave the cold for a few hours and be the first customers to come inside. Why? Why is that better than waiting the same amount of time later in the afternoon? I don’t know. But somehow it feels less frantic to me and to my comrades in the First-In-Line Posse. 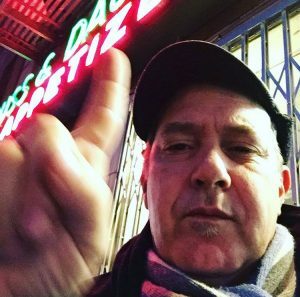 A few of the gang have passed on, or dropped out but the stalwarts are Charles — raised in the Lower East Side, but now living in New Jersey. A titan of granite in that state, counter-tops, tables, you name it. A heavy smoker, always at the tail end or the start of quitting, so the inevitable vape-pen or cigarette is always at the ready. Charles always brings his son. A pre-teen who refused to get out of the car when I first met him and now a second-year graduate student who braves the cold like us all. Charles is open and funny and a little in awe at how wealth has granted him the privilege of being generous: he buys all of his neighbors gifts of smoked fish every year. Then there is Patti Paige — a remarkable artist, baker and cookbook author (check @bakedideas on IG). Every year, Patti brings her receipts from the year before to make sure her order is correct and she doesn’t forget something essential. She is a slight woman, curly-haired with a wry sense of humor and a deep sense of curiosity about everything whether it be the dancehall music I spin or the reasons I choose Wild Western Nova over the Gaspe Bay Nova. Finally there are my friends Steven and Hana. Five years ago they were living in LA and had come to NY to see their parents. It was tough to find time to see them as both of us had many family obligations and such. So, I invited them to join me at Russ & Daughters at 5am. To my surprise, they actually showed up on a seriously cold morning. Due to their good humor and general goodness, they were immediately one with the crew and every year following they have joined me. For all of us, this weird little ritual was actually a high point of the holidays. Those couple of hours spent on line in the early mornings, in the sudden hush of an actual sleeping city, chatting and laughing and catching up was a most needed counterpoint to the frenzied shopping, family pressures and crowds of NY during the holidays. To be honest, to be in that circle of friends, clutching my sleepy son’s hand as he nursed a hot cocoa in the other, bathed by the flickering pink and green neon of Russ & Daughters, was to be in the warmest place of all of New York City. This year, I wasn’t in that circle. Tokyo is a long way away from Delancey Street and I was filled with a deep homesickness and sense of displacement as I read the greetings from the First-In-Line Posse more than an ocean away. In fact one of these greetings caused the owner of Russ & Daughters to ask about our group’s history and I penned an email to her, and in doing so, realized the second element of this rather long posting: the deeply Oedipal nature of my fish procurement. You see, I am a liar and a dissembler. 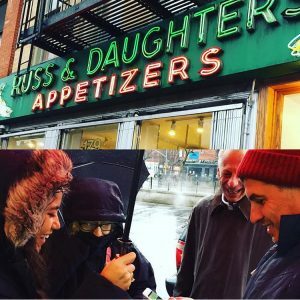 I told my friends that part of the joy in bringing my son to Russ and Daughters at 5am on a snowy morning, was that my own father had waited in the same line 40 years before with my own grubby paws intertwined with his. This is not true. The reality is that we lived in the Upper West Side, and part of living at 79th street and Riverside Drive is that your loyalties lie with Zabar’s. So, yes, it was at Zabar’s that I melted into my down jacket as I was crushed into the counter by maniacal old Holocaust survivors intent on purchasing that exact perfect smoked chub that put all the others to shame. When my parent’s moved from New York and we would gather in their new home in Colorado or my sister’s home in Rhode Island, it was a big overnight box from Zabar’s that would greet us on Christmas Eve. Sometime in the early 90s, I rebelled. I had eaten a brunch in a rambling old apartment building in Brooklyn Heights and the quality of Nova was so good that I had to ask from whence it was procured. Russ & Daughters. From that point on, I turned my back on my father and never stepped foot in Zabar’s again. I started bringing Russ & Daughters selections on Christmas Eve, a delicately smoked variety of New Zealand salmon here and a smoked sturgeon there. I pushed my family to take sides, to admit the superior quality of R&D over Zabar’s. Slowly, my scheme worked, my father and I would actually get into heated arguments about who was buying what from where, but eventually my offerings became the mainstay of our feast, with the Zabar’s boxes reducing in size year-after-year until they finally vanished. “Reducing in size”? Yes, I fully admit it, the question of which appetizing store was better was really an Oedipal battle, a battle to leave my childhood behind and become a full on adult with a giant cooler-bag of smoked fishes for my family. I smote my father with a whole, golden bronzed whitefish and bedded my mother on a mattress of everything bagels. Unlike good old Oedipus, I survived with eyesight intact, no curse plagued my realm and in fact my father happily reported that this year’s Christmas Eve feast was mail-ordered direct from Russ & Daughters. As victor, I find myself at a new cross-roads — 50 is right there, the newspaper at the end of driveway rather than the Timbuktu it was in my 20s. I have my own family, a wife and two children and we are here in Tokyo and new rituals need to be established. This year we fumbled a bit and perhaps highlighted our disconnection rather than overcome it. But, I trust in the fish and there are discoveries to be made, and perhaps we figure out how to make our own bagels and maybe there is a shop selling that New Zealand smoked salmon. Whatever it may be, next year will be better and perhaps twenty years down the line, my own son will still want to spend his Christmas Eves with us and eventually destroy me with a particularly delicious smoked yellowfin tuna only found in that one little shop in Azuba. I cannot imagine a better or more fitting end. A good story. Reminds me of going to temple as a young teenager. We always just had a minyun in a mostly Christian suburb of Boston. I remember the pickled herring lox, and bagels after the service. Lots of old men, many survivors of the Holocaust. They were nice to me, the youngest of the 10. Glad I could bring back memories! We loved everything about this piece !